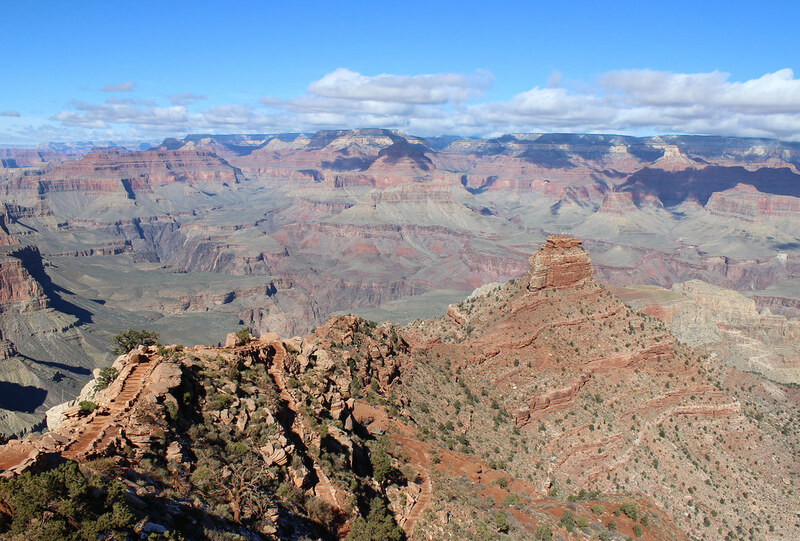 As we ran over the South Rim of the Grand Canyon in the dark early last November, I knew better than the rest of the group the risk presented by patches of packed snow and ice left from a storm earlier in the week. The others arrived at the canyon by van the night before after flying from Missoula to Las Vegas, while Jen and I drove south and spent most of the week there hiking and sightseeing. 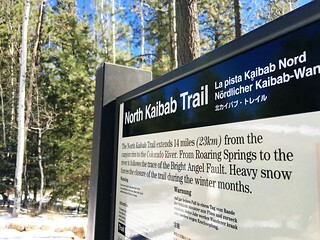 Two days before the run – the morning after it snowed – it was clear that a slip or a step too far to the side of the South Kaibab Trail could result in a fall down a cliff. I don’t think snow was on anybody’s mind back in Missoula months earlier, when we received the invitation to run the well-known double crossing of the canyon by email. Certainly, the distance (about 46 miles), the elevation gain (more than 10,000 feet), heat and water availability were. Fortunately, the snow and ice lasted only a few switchbacks into the run, and the worse trail conditions higher on the North Rim were encountered at midday. 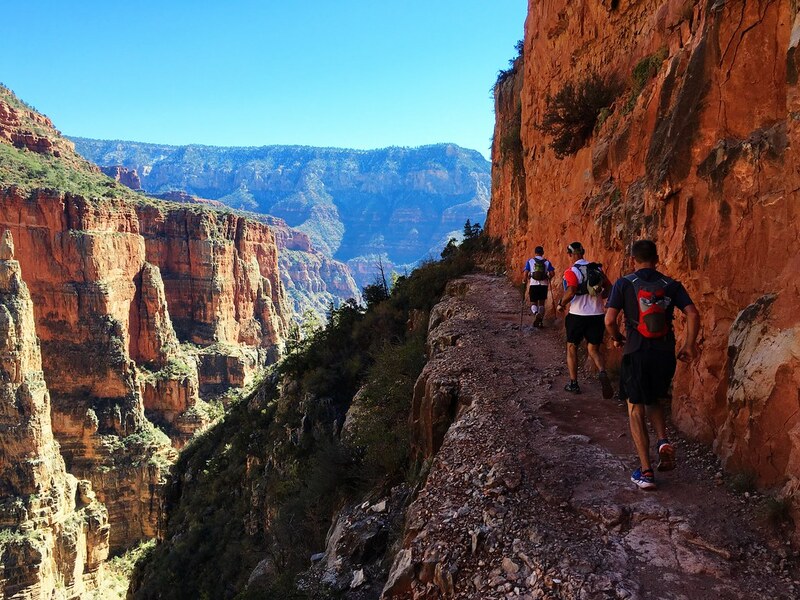 In the end, everybody made it out of the canyon safe – some completing the full R2R2R, some going Rim to River, some turning around early and one getting a ride back from the North Rim. After being dropped off about 5 a.m. at the intersection of Desert View Drive and Yaki Point Road, where a gate keeps private vehicles from reaching the South Kaibab trailhead, we set out by headlamp. About half a mile beyond the gate, we entered the canyon at 7,260 feet. At Skeleton Point about 3 miles down to the north, another runner and I found ourselves out ahead of the main group with a faint glow backlighting the top of the canyon to the east. I had never met him before and was concerned about the pace the rest of the day, so slowed a bit in the hope of letting the others catch up. 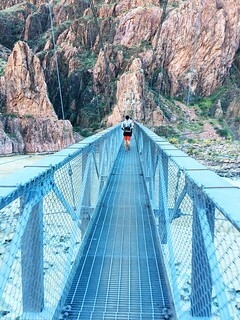 The other runner pulled away as the bottom of the canyon grew lighter, and I was on my own when I stepped out of the tunnel onto the Black Bridge crossing the muddy Colorado River at 2,480 feet. 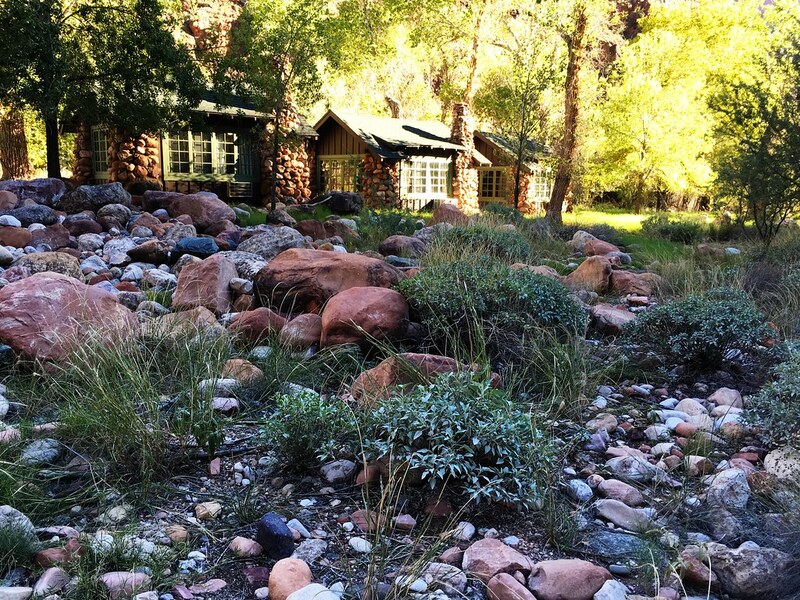 About a third of a mile west, I crossed Bright Angel Creek and and went through the lush green Bright Angel Campground at 7 miles before returning to the east side at Phantom Ranch. Taking a cue from people in the camp and at the ranch, I ate some food as I walked through the area. Running northeast from the ranch, I crossed the creek several times as I followed it upstream through a narrow section of the North Kaibab Trail known as The Box. High above, I could see the first sunlight reaching rocky points. Out of The Box, I passed Ribbon Falls off the west side of the creek and continued up the trail to Cottonwood Campground, about 7 miles from the ranch. Looking back, I still couldn’t see the rest of the Missoula group, and a handful of other runners I encountered along the way said it had been a while since the one person ahead of me passed. Almost 1.5 miles beyond the campground and after a few small cascades, I crossed the creek at the Pumphouse Ranger Station and the trail began to climb steeply northwest into the Roaring Springs drainage. As the trail rose along sunny cliffs, I passed a group running Rim to Rim from north to south. After crossing a bridge and ascending several switchbacks, I reached Supai Tunnel, about 1.7 miles below the North Kaibab trailhead. Above the tunnel, the trail left the cliffs and entered the shade of the forest, where the final switchbacks were covered by a thick layer of snow and ice. As I reached the trailhead at 8,241 feet and 21 miles from the start, I caught up to a couple of other runners and we chatted as we ate and refilled our hydration packs from an icy spigot. Just as I was getting ready to follow the other runners back down the trail, three friends from Missoula reached the top, so I waited – it would be nice not being alone on the way back across. As the four of us started back down the North Kaibab Trail, we passed all the other runners from Missoula who would reach the rim above Supai Tunnel. At the bridge below the tunnel, we passed a few more who turned around based on the time of day. After that, we descended quickly, one person dropping off as we backtracked through the canyon. The three of us who remained followed a short side trail across Bright Angel Creek to Ribbon Falls, and as we bushwhacked back we found two other Missoula runners who were extending their Rim to River route. Across the creek on the main trail again, our group of five continued down through The Box to Phantom Ranch, where we met other Rim to River runners from Missoula and stopped to eat – and drink one of the best cups of lemonade in memory. 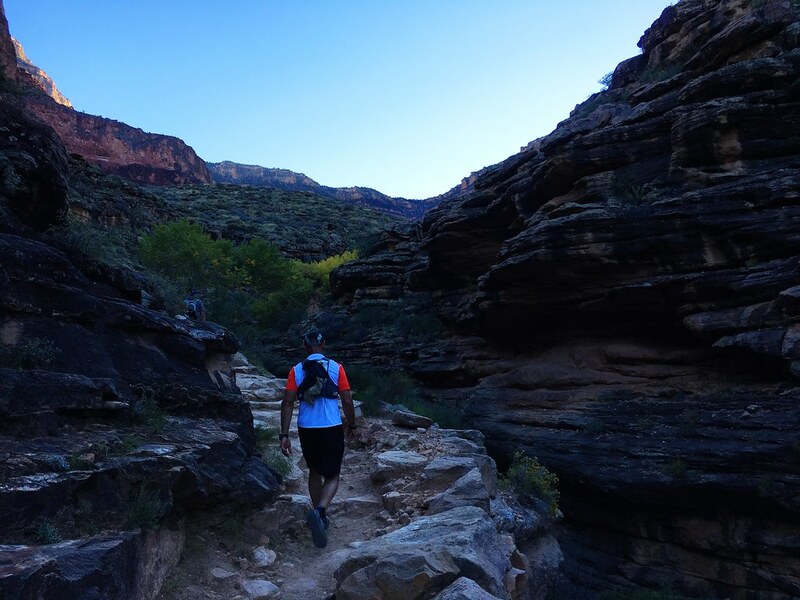 After departing the ranch and campground, one Rim to River runner stayed with the three of us making the double crossing as the others outpaced us up the Bright Angel Trail. A short distance downriver, we crossed the Silver Bridge to the south side of the Colorado and continued to River Resthouse, 1.5 miles from the campground. There, the trail began to climb. 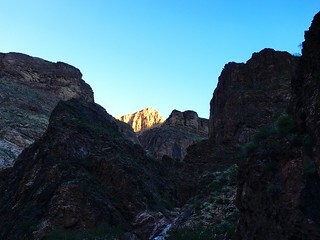 As the daylight faded, we moved steadily up the trail for the next 3.2 miles, through the cottonwoods and cliffs of the Garden Creek drainage to Indian Garden Campground. Noticing I had a signal on my cellphone, I sent Jen a text message updating her on our progress. Above the campground, we began the arduous ascent of the final steep switchbacks up the cliffs to the South Rim. After passing the Three Mile and Mile and a Half resthouses, we stopped to put on our headlamps as darkness set in. Looking over the edge of the cliff, a line of lights along the trail below turned our way – we had inadvertently shown other hikers and runners how far up they still had to go. The final mile was slow, but we still passed numerous hikers on the popular trail. And I pulled ahead slightly at the end, officially becoming the second R2R2R runner from the Missoula group to reach the Bright Angel trailhead, about 46 miles and 13 hours 12 minutes after starting. Jen greeted me with news that she made it to the river and back on a toe she broke before our trip, then gathered the four of us who made the final climb out together for a photo. To our surprise, one friend who we thought would be the final person from Missoula to complete the double crossing was there, too. He had done the run before, and realizing his slow progress this time, got a ride back from the North Rim on one of the last shuttles of the season – which conveniently arrived there about the same time he did. The next few hours were spent greeting other runners at the trailhead, getting cleaned up in our nearby cabins, and celebrating the day with dinner and drinks at the Bright Angel Lodge. After breakfast the next morning, Jen and I started driving back north while the others returned to Vegas and celebrated another night before flying home. Talk of making a destination run an annual tradition started soon after we arrived back in Missoula. Here are more photos from the Rim to Rim to Rim run. After two days of driving and a stop to hike a slot canyon, we arrived on the South Rim of the Grand Canyon last fall just as the sun was setting. We took in the expanse from the Desert View Visitor Center as the last light of day faded over the rim to the west and darkness overtook the Colorado River below. The brief view would have to suffice until the next morning as we continued on to our hotel in Tusayan, Arizona, just south of the national park’s boundary. Our trip was several months in the making, so one more night wouldn’t matter. 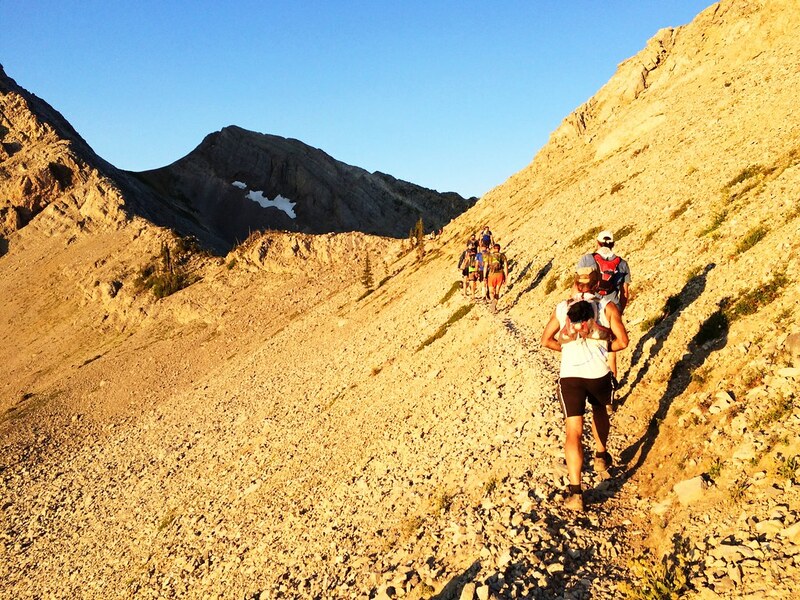 The planning started when I received an invitation to run Rim to Rim to Rim with a group from Missoula. Jen had been to the Grand Canyon before, but only briefly – and no way would I be going for the first time without her, she said. So while the rest of the group bought plane tickets for a four-day weekend, we opted for a weeklong road trip. Arriving ahead of the rest of the group, we went hiking and did some sightseeing early in the week – in fact, our hikes ended up being the only time I saw some sections of the Bright Angel and South Kaibab trails in daylight, as the run started and ended in the dark. We also got some on-the-ground updates for the group about trail conditions and water availability on the North Rim. We planned to keep costs down by sleeping in a tent for a few nights before staying in a cabin on the rim at Bright Angel for the run. 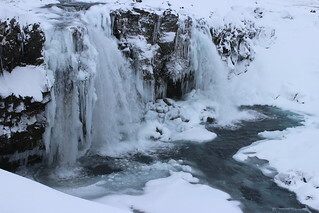 Instead, we ended up in the hotel because the temperature was too cold – we even had a day of snow. Below are the hikes we went on before others arrived; the run will come in a separate post. 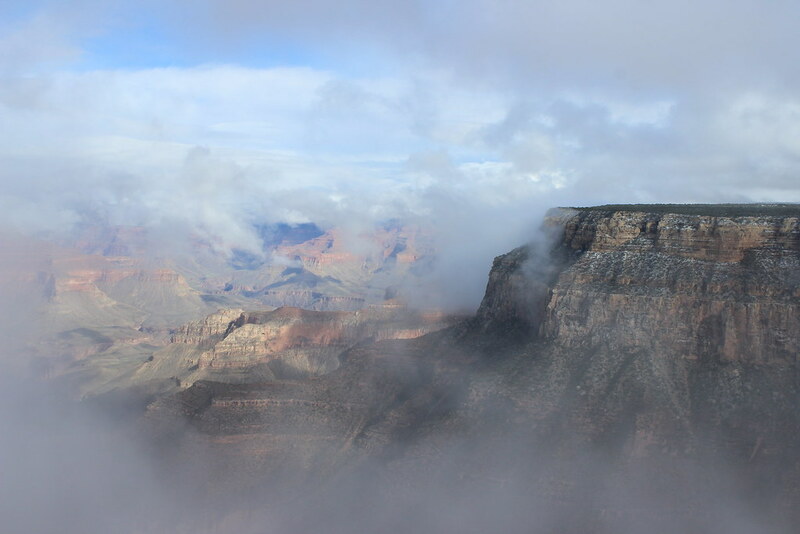 Our first morning in the park – crisp with partly cloudy skies – we started down the Bright Angel Trail from 6,860 feet on the South Rim. As we descended switchback after switchback northwest between Maricopa and Grandeur points, the temperature rose and we soon removed jackets and pant legs until we were in shorts and T-shirts. Past the Mile and a Half and Three Mile resthouses, where tourists took breaks in numbers, the switchbacks ended and the trail straightened and became less steep as it reached the Indian Garden Campground at 4.8 miles. Crossing to the west side of the creek just below the campground, we left behind the crowded main route and continued out a mostly level trail to Plateau Point at 6.3 miles and about 3,100 feet below the trailhead. 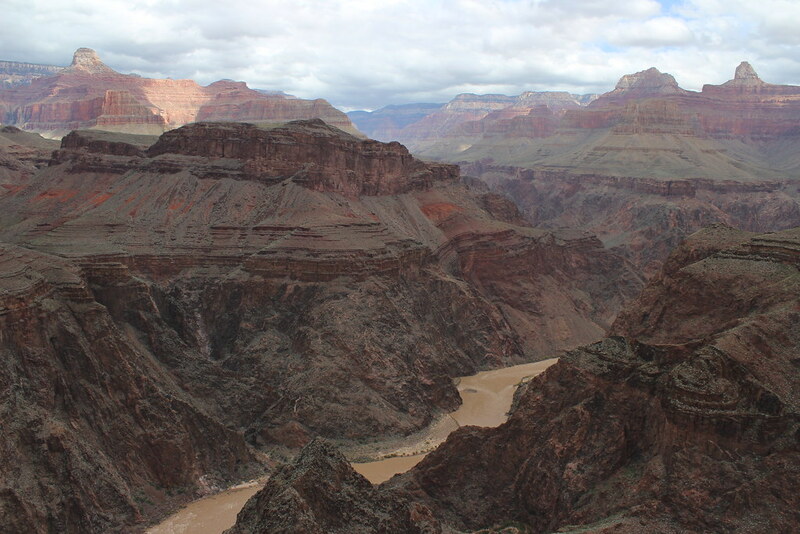 The point overlooks the Colorado River as it winds from the confluence with Bright Angel Creek on the east out of sight around a bend to the west. 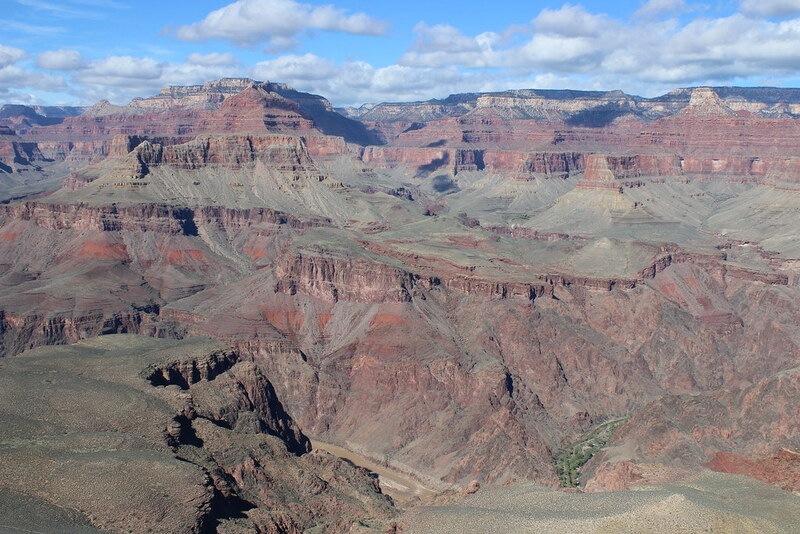 Across the river, many points, buttes and temples – Sturdevant, Johnson, Schellbach, Hillers, Clement Powell, Buddha and Manu – rise to the North Rim. As we hiked back up from the campground, clouds closed in and rain began to fall. We kept our coats off, however, as the climb kept us plenty warm. 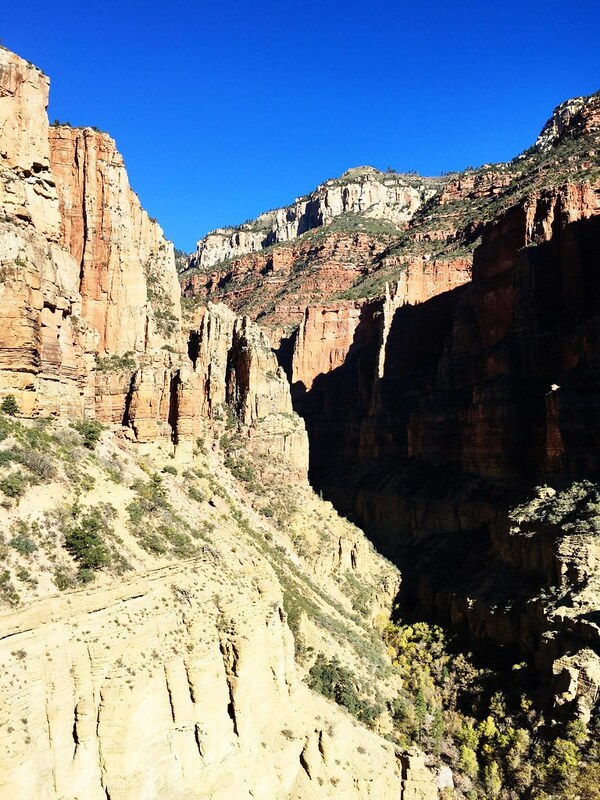 Here are more photos from the Bright Angel Trail. Distance: 12.6 miles round trip. Trailhead: The trail begins a couple of hundred yards west of the Bright Angel Lodge, next to a restroom and mule corral. The next morning was considerably colder and the weather was expected to deteriorate, so we decided to take the shuttle bus west to Hermits Rest and walk back to Bright Angel on the mostly level Rim Trail. Soon after we stepped off the bus, we saw our first snowflakes, and they continued intermittently most of the day. Walking east on the wide, paved path, we passed plenty of other people in the first 2.8 miles from Hermits Rest to Pima Point then the Monument Creek Vista. Other hikers became fewer and farther between as the trail narrowed and turned to dirt and gravel, and after about another mile we reached The Abyss, where the rim drops off and the view of the Monument Creek drainage opens up. 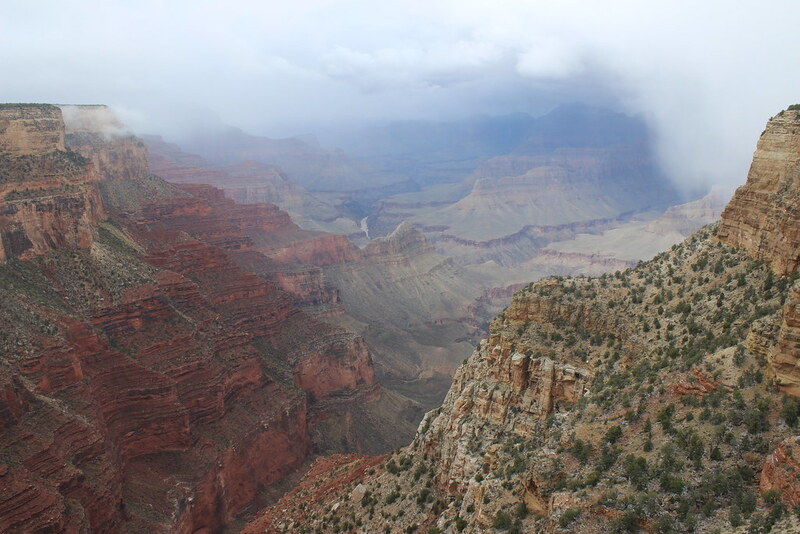 As we arrived at Mohave Point, a little more than a mile east, it began snowing in earnest, with flakes “falling” up the canyon wall on gusts of wind. 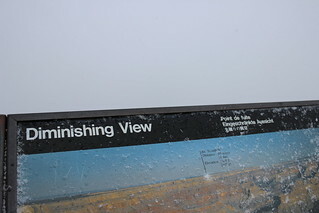 A sign titled “Diminishing View” at Hopi Point about 0.8 miles farther couldn’t have been more accurate, though it refers to air quality rather than precipitation. From the memorial to Colorado River explorer John Wesley Powell at Powell Point, another 0.3 miles east, we watched as the clouds broke and revealed Maricopa Point. Returning to the paved path, we continued half a mile to Maricopa Point, then 0.7 miles to Trailview Overlook with its views of the Bright Angel switchbacks and the iconic rooftop of the El Tovar Hotel. After another 0.7 miles and a couple of hundred yards, we finished at the shuttle stop and Bright Angel trailhead. Here are more photos from the Rim Trail. Distance: 7.8 miles one way. Trailhead: We boarded the shuttle bus at the stop a couple of hundred yards west of the Bright Angel trailhead, rode it west to Hermits Rest and hiked back from there. 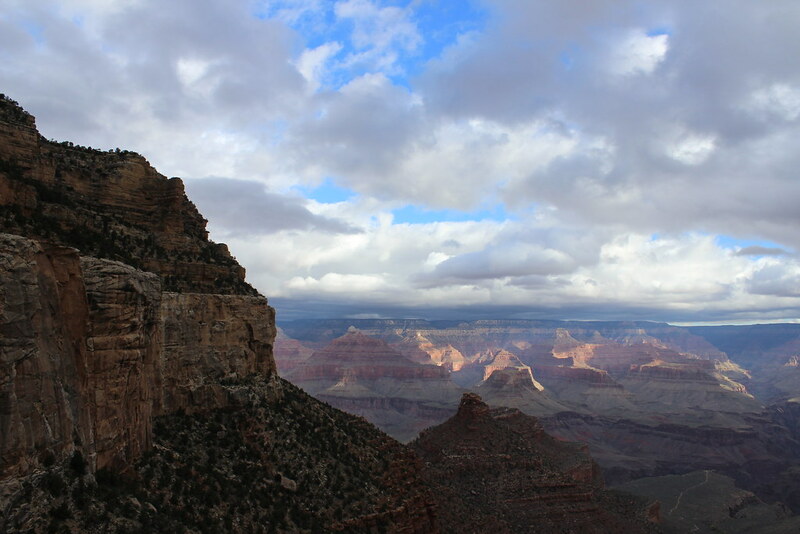 Waking to mostly sunny skies and snow on the ground the next day, we took in the panoramic view at Mather Point before riding the shuttle east to the South Kaibab trailhead at 7,260 feet. When we started down the trail, the first short switchbacks in the shady canyon were an icy, gravelly mix – both a little slick and offering some grip. Half a mile down, the trail melted as it met the sun and straightened to the north below Yaki Point. After another set of switchbacks, we arrived at Cedar Ridge, where weathered snags overlook O’Neill Butte at 1.5 miles. We continued down the ridge, rounding the eastern side of the butte and hiking out to Skeleton Point, at 3 miles and 2,000 feet into the canyon our destination for the day. 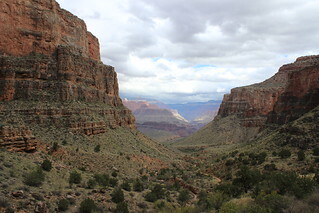 From the point, we could see west across to the Bright Angel Trail and Plateau Point and north down to the bottom of the canyon, where a patch of green indicates the location of Phantom Ranch. Back at the top of the trail, the ice retreated as the sun reached switchbacks. 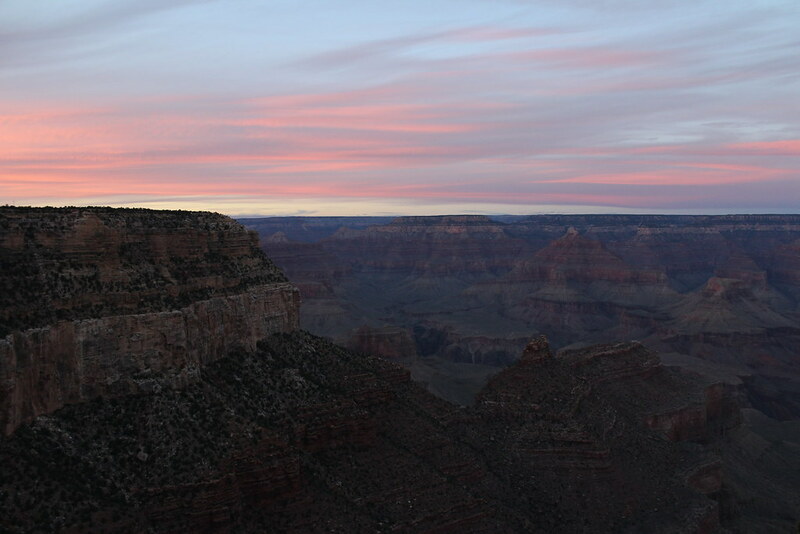 And before leaving that night, we were treated to a gorgeous sunset outside the El Tovar Hotel – with wispy clouds highlighted pink over the North Rim. 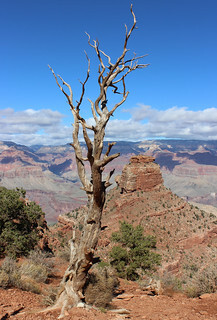 Here are more images from the South Kaibab Trail. Trailhead: The South Kaibab trailhead is closed to private vehicles, but is easily reached by riding a shuttle bus a few minutes east from Grand Canyon Village. We spent most of the next day sightseeing east along the South Rim, waiting for the group of runners from Missoula to arrive. Then it was early to bed before the dark start of the Rim to Rim to Rim. On our second trip to Arizona last fall – my first time to the Grand Canyon – we drove and took the opportunity to stop in southern Utah on the way. Zion National Park is about the halfway point between Missoula and the South Rim, so we stopped there to camp for the night. The next morning, we left shortly after sunrise without hiking in the park because we planned to try a slot canyon between Kanab and Page, Arizona. After stopping at the Bureau of Land Management office in Kanab to check conditions, we continued south to the Wire Pass trailhead in the Vermilion Cliffs National Monument. 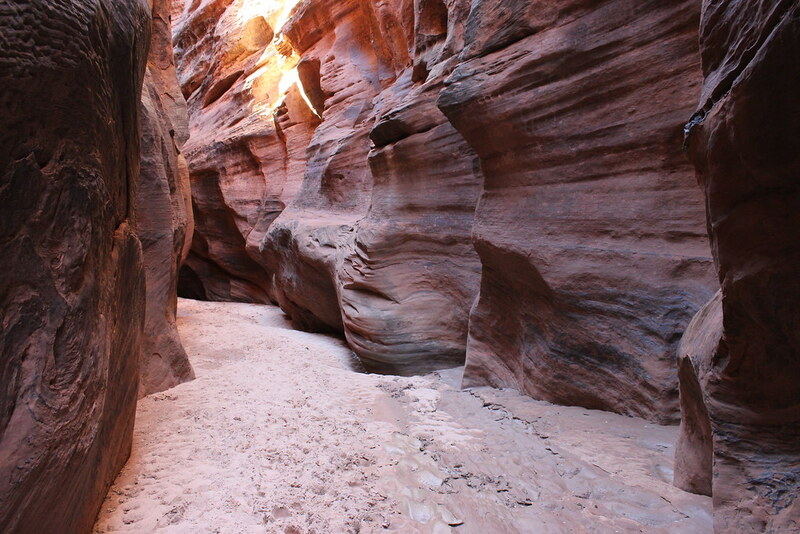 There, we hiked through the through the Wire Pass slot canyon to Buckskin Gulch – which is said to be the longest and deepest slot in the Southwest at 13 miles and, in places, 400 feet, respectively. The first mile of the Wire Pass trail is rather plain – west down a dry wash surrounded by orange sandstone hills. 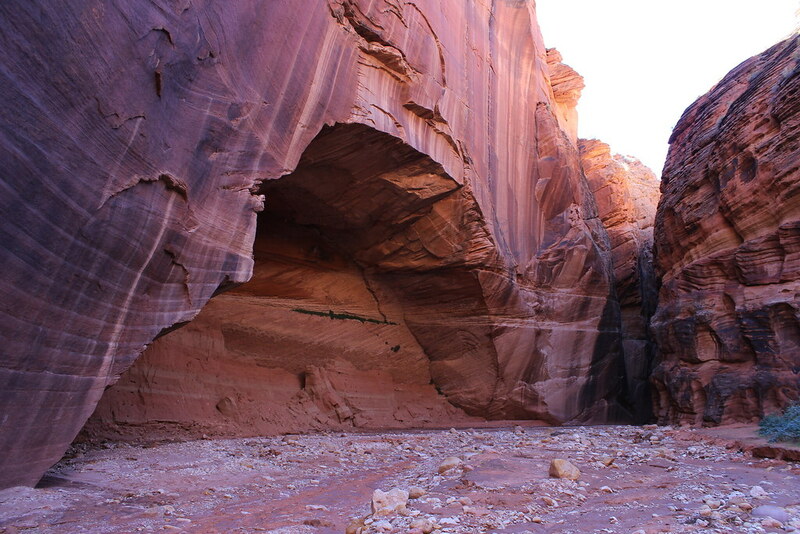 Half a mile from the junction with Buckskin Gulch, however, the canyon walls soon close in. As we entered the slot canyon, we passed a couple who turned back disappointed after finding a 15- to 20-foot drop a short distance inside that likely requires a rope to descend. After a little looking around, however, we easily found a route over the top marked by rock cairns. That one drop must prevent many people from continuing, as we saw only one other person beyond that point. Before reaching the junction with Buckskin Gulch, we passed through the narrowest section of slot canyon we would encounter – a few feet wide, at most, with a sliver of sky visible high above us. At 1.7 miles, the canyon widens again at the junction. With GPS for the most part useless, we explored Buckskin Gulch based simply on time since we still had to drive to the Grand Canyon that day. 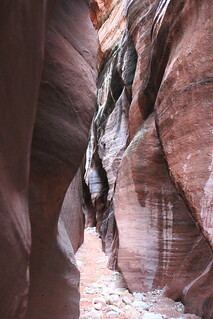 We followed Buckskin north first, the canyon walls varying from about 5 to 15 feet wide. 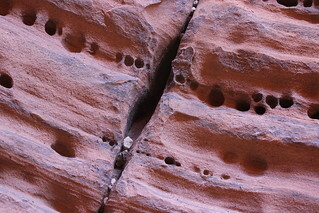 Along the way, we found interesting patterns and pockmarks on the otherwise smooth sandstone, as well as a snake and a lizard. After returning to the junction and following Buckskin east, it became apparent we should have gone that direction first – the canyon there is much narrower and more dramatic than the northern section. Unfortunately, we weren’t able explore much since we had to continue on our trip. 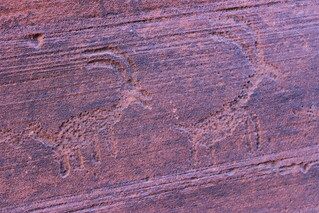 On the way out, we stopped to inspect rock art on a wall at the junction before making our way back up the Wire Pass trail. Before reaching the trailhead, we encountered a group coming out of the Coyote Buttes area, where the well-known Wave feature can be found – but with permits required even for day use, we’ll have to return another time. Here are more photos from Wire Pass and Buckskin Gulch. 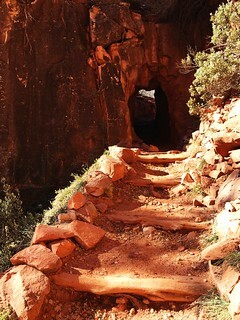 Distance: The Wire Pass trail is 3.4 miles round trip to Buckskin Gulch. From the junction, the Buckskin Gulch Trail travels 4.5 miles north and 11.3 miles east; we explored a short distance in both directions. Trailhead: The Wire Pass trailhead is 8.3 miles south on the rough House Rock Valley Road, of U.S. Highway 89 about 38 miles east of Kanab, Utah, and 34 miles west of Page, Arizona. 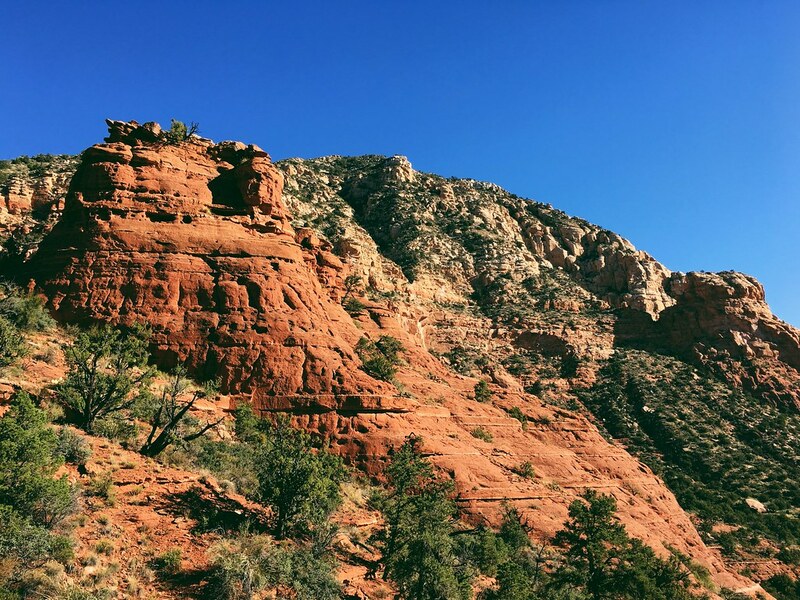 The first of two fall trips to Arizona allowed us to get out in the Sedona and Scottsdale areas – both of which offer easy access to trails. It’s been several years since we’ve met relatives in the Phoenix area, and in the past we’ve taken the opportunity to drive north to Sedona’s red rock country or south to Saguaro National Park and Tucson. 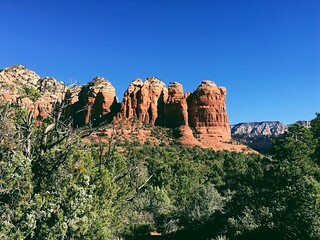 This time we arrived a day earlier than others, so spent the first night in Sedona. There, we went on short hikes to a natural bridge and around a spire to a rocky promontory. After that, we stayed in Scottsdale, which provided fairly easy access to parks. We hiked to the top of a peak on the edge of the valley one day, then I ran up the highest mountain in Phoenix the next morning. 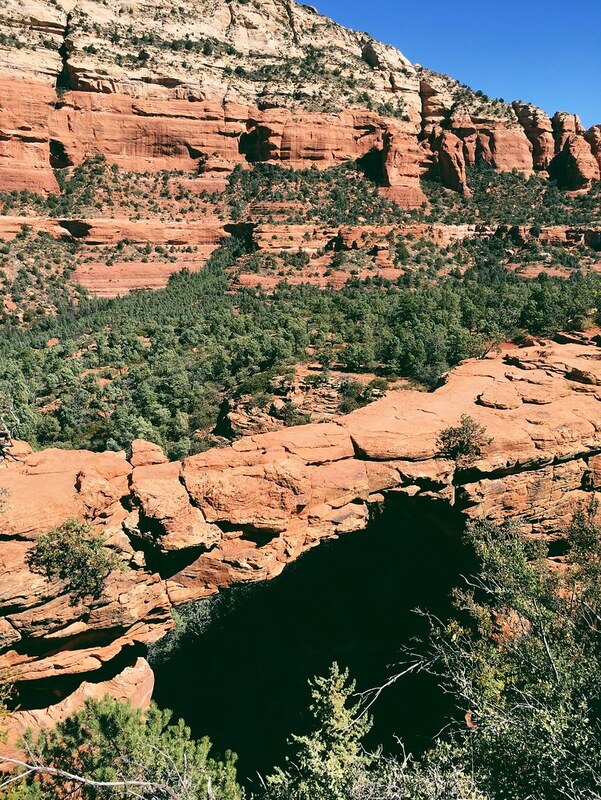 Devil’s Bridge is the largest natural arch in the Sedona area, and there are multiple routes leading to it. Because we were only in the area for one night, we chose the shortest trail to get a second hike in before leaving. Starting from the Dry Creek Vista trailhead, we walked 1 miles northeast on the dusty, rutted Forest Road 152 to the official Devil’s Bridge trailhead. The road traveled up and down slightly with mountains of the Red Rock-Secret Mountain Wilderness rising to the southeast. At the Devil’s Bridge trail, we turned east and continued uphill into the trees. After a final steep section, we reached the top of the 50-foot arch just inside the wilderness. Devil’s bridge is sturdy enough to walk on and provides views across the canyon – it’s also a popular spot, and you won’t be alone. After waiting our turn to take photos of the arch, we hiked back to the trailhead the same way. Here are more photos from Devil’s Bridge. Distance: About 3.6 miles round trip. Our second hike before leaving Sedona linked several trails below the mountains on the north side of town. Starting from the Thunder Mountain trailhead, we hiked uphill to the northwest along the base of three-spired Chimney Rock and past two junctions. At a third junction at about 0.3 miles, we continued north for 0.5 miles, then turned east at a junction and climbed to Chimney Rock Pass, briefly entering the Red-Rock Secret Mountain Wilderness. Down from the pass at about 1.2 miles, we continued west for 0.7 miles on the fairly open Thunder Mountain trail with Capitol Butte rising to the north. At a junction with the Adante and Teacup trails, we continued east on Teacup for 0.3 miles. After crossing a wash, we turned southeast on the Sugarloaf Loop trail then again on the Sugarloaf Summit trail, climbing to the open top of the rock formation at 2.7 miles. The outcrop provided excellent views of town and the surrounding mountains, including Coffee Pot Rock. Backtracking down Sugarloaf and west on the Teacup trail for 0.8 miles, we returned to the junction with the Adante trail and followed it west, slightly south of the Thunder Mountain trail, for 0.6 miles. Just past the Adante trailhead, we turned south along the base of Chimney Rock and continued about 0.5 miles back to where we started for 4.6 miles total. Here are more photos from Chimney Rock and Sugarloaf. Distance: About 4.6 miles round trip. 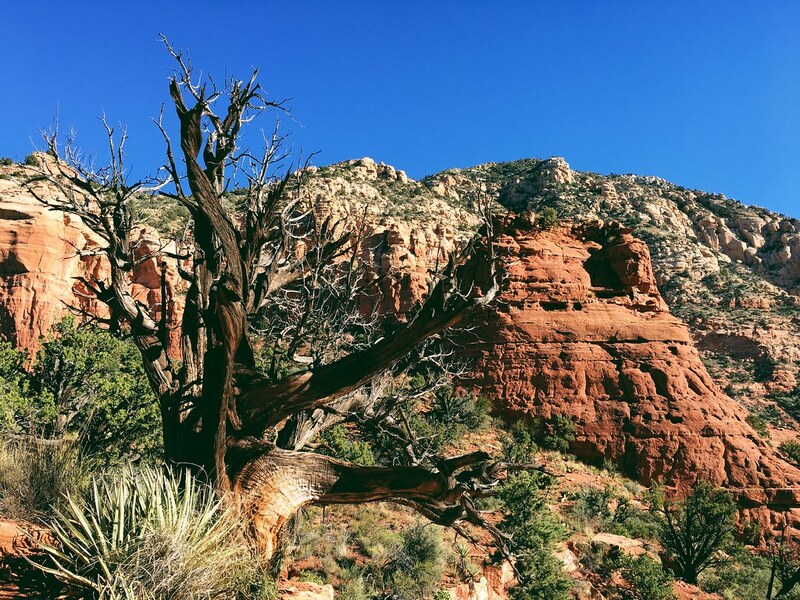 Trailhead: From the intersection of Arizona Highway 179 and U.S. Highway 89A in Sedona, drive 2.5 miles west on 89A, 0.6 miles north on Adante Drive, and 0.3 miles west on Thunder Mountain Road, then turn north into the Thunder Mountain trailhead. 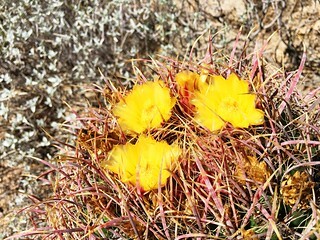 In Scottsdale, temperatures reached the mid-90s – on the high end for us – but they didn’t keep us from getting out as long as we carried plenty of water. 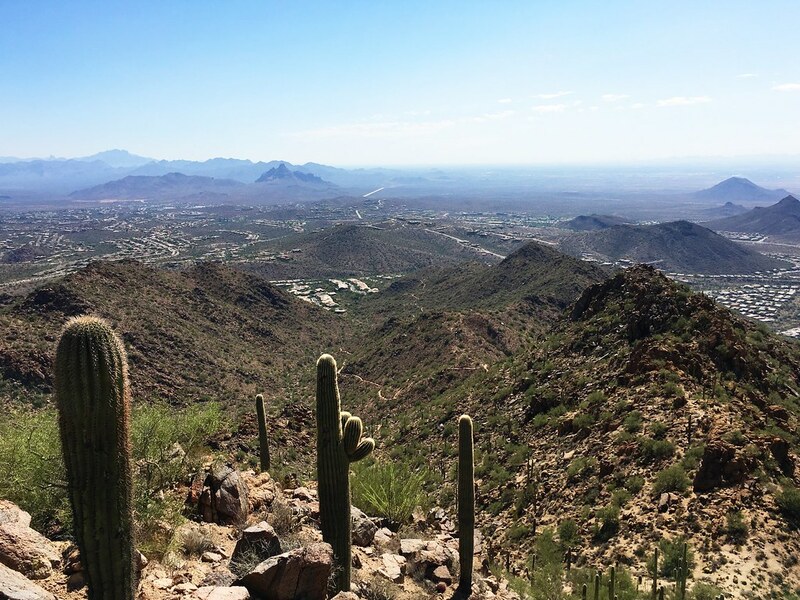 On our first full day there, we hiked to the top of 3,069-foot Sunrise Peak in the McDowell Sonoran Preserve to the northeast of the city. Even starting mid-morning, it was already well into the 80s. 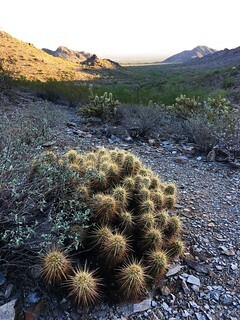 From a parking area in a neighborhood at the east end of the trail, we climbed steeply and steadily northwest up a cactus-filled canyon. A ridge line above switchbacks at about 1.2 miles provided views across the Phoenix metropolitan area to the west. Another 0.6 miles up, we reached a second viewpoint and a junction with the trail west to the top. After the final 0.25 miles of switchbacks to the top, we found shade under a small tree and views all around – the metro area to the west, farther into the preserve to the northwest, the Fountain Hills to the northeast and the Superstition Mountains in the distance to the east. The route continued west to another trailhead, but with the temperature rising, we descended southeast back to our air-conditioned car. Here are more photos from Sunrise Peak. Distance: About 4.1 miles round trip. Trailhead: From North Scottsdale Road, drive 8 miles east on East Shea Boulevard, 0.5 miles north on North 136th Street and 1.4 miles east on East Via Linda to the Sunrise trailhead. Before anyone else woke the next morning, I went on a sunrise run up Piestewa Peak in the Phoenix Mountains Preserve. At 2,608 feet, it’s the highest in the metropolitan area. About 0.5 miles down the canyon from the pass, and past another junction and a trailhead, I turned onto Trail 302 and continued southwest. 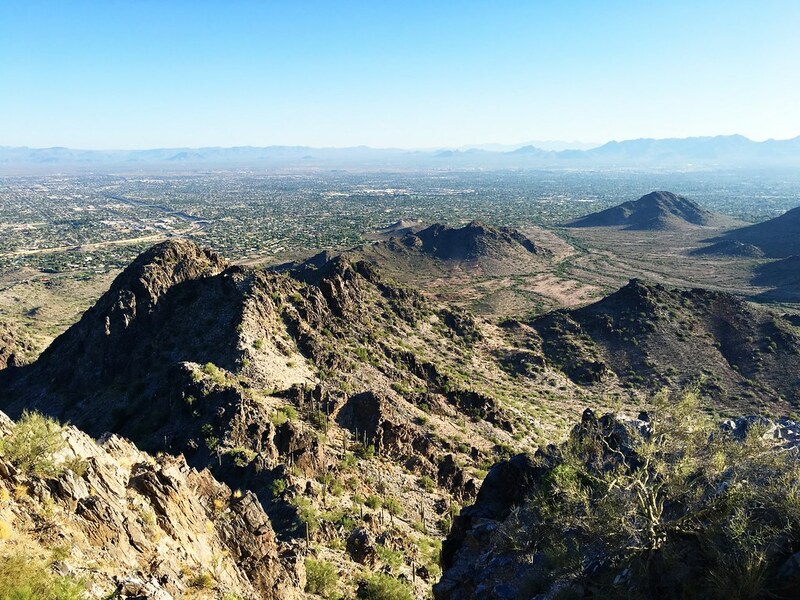 About 0.6 miles farther down the canyon, Trail 302 merged with Trail 300 – and I merged into a crowd – just above a popular trailhead for Piestewa Peak. After the junction, the trail widened and was paved in places with steps. My pace slowed as I climbed, occasionally waiting to pass people. The trail continued a short distance then turned north and split at about 0.5 miles. From there, I followed Trail 300 northeast, rounding a ridge line and scrambling up the final rocks to find a U.S. Geological Survey marker at 4.9 miles. After taking in the surrounding view from the sunny summit and eating some food I brought along, I retraced my route back across the preserve in mid-80s heat. 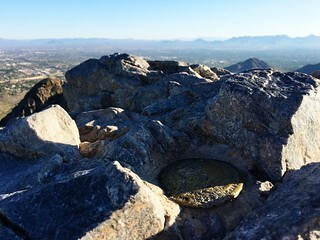 Here are more photos of Piestewa Peak. Distance: About 9.8 miles round trip. Trailhead: The 40th Street trailhead is 4 miles east of North Scottsdale Road on East Shea Boulevard, the 1 mile south on North 40th. On the last weekend in July, I joined a group of Missoula friends for the Run Across The Bob, or RATBOB. 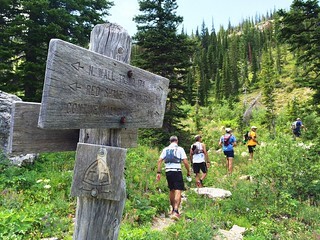 The annual run – this was the third year – is loosely organized, covers 50-some miles and crosses the Bob Marshall Wilderness from east to west. The 1 million-acre wilderness area was designated with the passage of the 1964 Wilderness Act. We left Missoula on a Friday afternoon and camped at the Mill Falls Campground on the Rocky Mountain Front west of Choteau, stopping in Augusta for dinner at the Buckhorn Bar and last-minute supplies at the grocery store next door. Early the next morning, we packed up camp and got our gear together for the day, then drove to the South Fork Teton trailhead a mile up the road to the southwest. About 5 a.m., we started up the trail southwest to Headquarters Pass by headlamp. 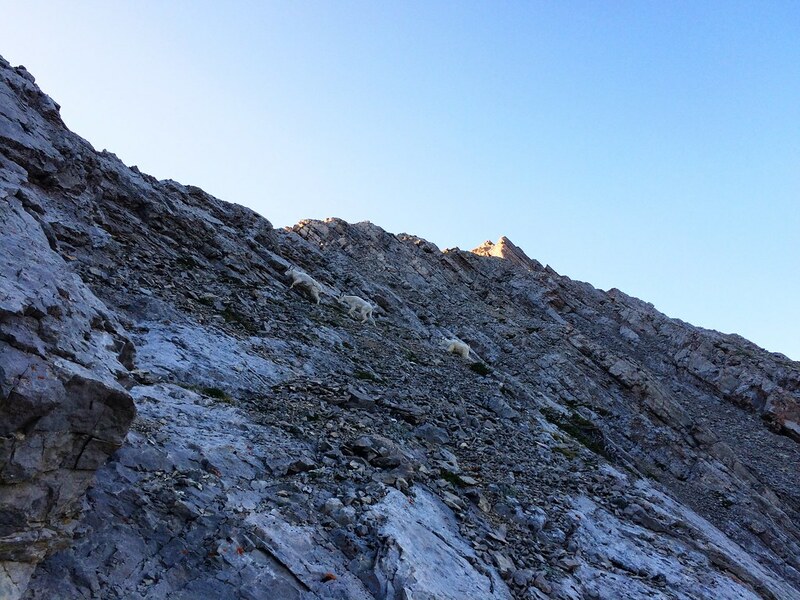 The first 4 miles were some of the more scenic parts of the day, as we passed a tall, streaming waterfall, took in sunrise on the talus slopes below Rocky Mountain, and were greeted at the 7,755 pass by a group of mountain goats. At the pass, we said goodbye to our shuttle drivers, who ran back down to the trailhead then spent the day on the road and setting up camp near the end of our route on the west side of the wilderness. At that point, there was to turning back. For the next 8 miles, we descended west along Headquarters Creek to the North Fork of the Sun River. After a stop to eat some food, we crossed a pack bridge over the river and headed for the Gates Park Guard Station. With several trails meeting at the guard station, the scene of our group stopped at a junction consulting multiple maps made for a moment of humor – especially when we found the cabins and backcountry airstrip just beyond the stand of trees in front of us, at about 13 miles. From the guard station, we continued west up Red Shale Creek on the Continental Divide Trail, splitting into several smaller groups. The area burned in a 2013 wildfire, making for a sunny, warm run, and many of us made our first stop to refill water bottles and bladders here. While I was among those who carried a filter, this was the only place I used it – several people who went on previous years’ runs found the water safe when left untreated, and I joined them out of convenience. After entering thick forest for a couple of miles, we reached a meadow at the base of the North Wall near 21 miles and stopped to wait for others to rejoin the group. The North Wall is an extension of The Bob’s famed Chinese Wall, a 22-mile-long escarpment that averages 1,000 feet in height. For the next 13 miles, we followed the trail north along the base of the wall, splitting into smaller groups again as we crossed several small passes and burn areas that offered views up and down the cliff line. Eventually, we turned west and climbed steeply up the wall for a mile to Switchback Pass near Kevan Mountain. From the pass we could see back south along the wall and east to where we started. The 7,767-foot Switchback Pass got its name from the trail on its west side – in less than 4 miles, we dropped about 3,000 feet to the southwest and rounded more than 40 switchbacks. Back in the forest at the bottom, the trail became level as we waded across Pentagon Creek and reached Pentagon Cabin at nearly 40.5 miles. From the cabin, we followed the Spotted Bear River northwest, meeting a couple of our shuttle drivers after about 2 miles. After spending the day on the road and setting up camp, they were gracious enough to run a pack full of snacks in and offer support. Our groups split up even more in the final miles and I ended up on my own for much of it. After wading across Dean Creek and passing the silty, turquoise waters of the Blue Lakes, I reached the other shuttle drivers and first runners gathered at the Silvertip trailhead – about 50 miles and 15 hours after we started. After a short recovery period, the first of us back piled into an SUV and drove down to the Spotted Bear Campground, where another shuttle driver was tending a buffet of hot food and cooler of beer. After a quick rinse-off in the river as the sun set, we ate, awaited the return of the rest of our group and recounted the day for the drivers before finally falling asleep in our tents. The next morning, we packed up camp and drove home, crowding a small cafe in Hungry Horse for breakfast. Here are more photos from the RATBOB. After several years of point-to-point backpacking in Glacier National Park, we returned to day hiking last summer, largely due to the forecast. While a rainy day isn’t out of the ordinary for our late-July trips to the park, the forecast this year was for much more precipitation. And it delivered – a couple of our hikes were the wettest we’ve been on outside of Olympic National Park, Scotland or Iceland. Fortunately, we’ve learned that good rain gear – jacket, pants, pack cover – is worth the expense. This year, we also visited parts of the park that we don’t usually get to – the North Fork of the Flathead, the less crowded Poia and Cracker lakes in the busy Many Glacier area, and Firebrand Pass outside East Glacier. It was the first time I’d been to the North Fork, where we camped at Bowman Lake and made the obligatory stop at the Polebridge Mercantile for baked treats. On the east side of the park, we camped at Rising Sun, which along with the St. Mary campground we’ve always found to be good staging areas for getting out. The morning after arriving at the Bowman Lake campground, we hiked to the Numa Ridge Lookout, which provided good views over the North Fork despite gray clouds overhead. From the boat launch, the we followed the trail northeast along the shore of the lake for a relatively flat three-quarters of a mile, then turned north at the Numa Ridge junction. From there, the trail rose to a small, forested lake – which we didn’t see until we were above it – at about 3.5 miles. After the lake, the trail climbed the ridge in earnest, on increasingly shorter switchbacks. As we approached the lookout, the trees grew smaller and the views opened up. 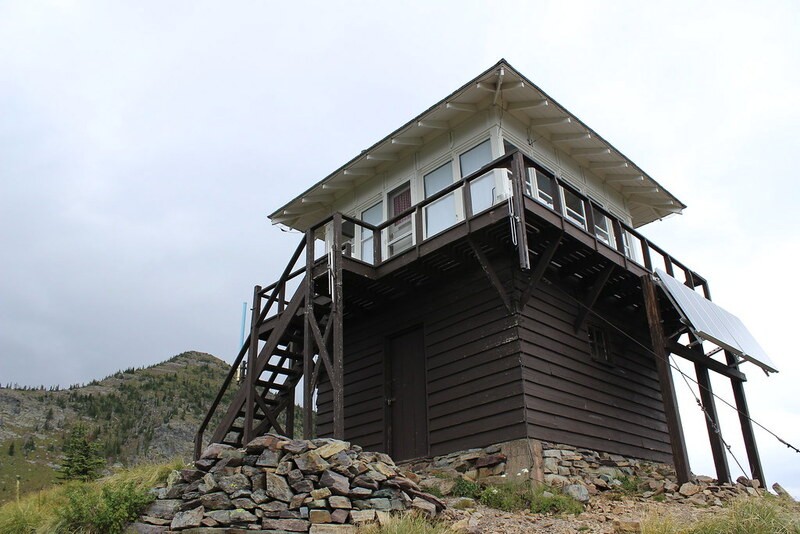 At 5.7 miles, we arrived at the lookout, on a grassy, 9,960-foot high point that offered views of the North Fork Valley below, the Whitefish Range to the west and, eventually, the Livingston Range above the top of Bowman Lake. Light rain began as we ate and took photos, so we turned back downhill. At the small, forested lake, the rain began to fall harder and thunder boomed overhead, so we picked up our pace back to camp. 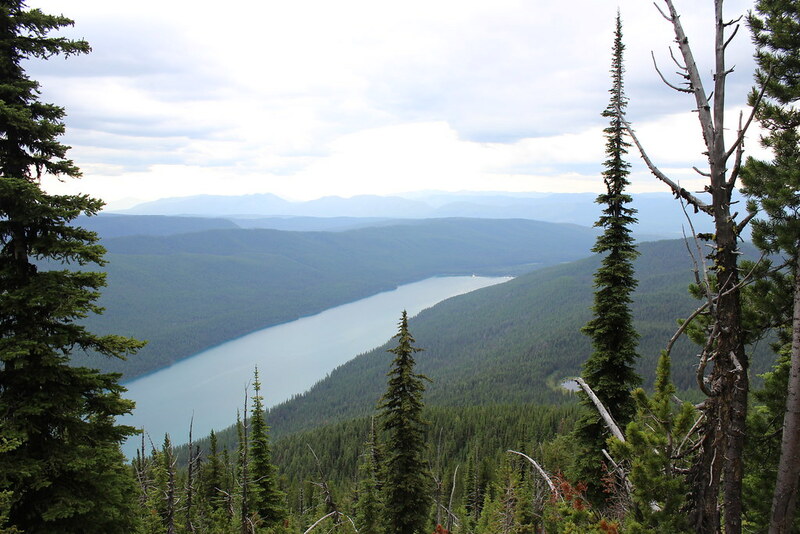 Here are more photos from Bowman Lake and the Numa Ridge Lookout. Distance: 11.4 miles round trip. Trailhead: The trailhead is at the boat launch at Bowman Lake. 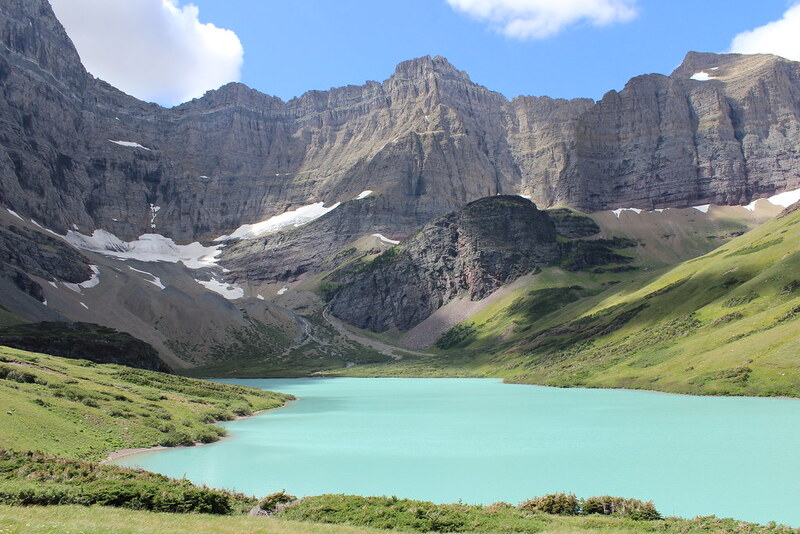 From Apgar, the lake is about 11.5 miles northwest on the Camas Road, 13 miles northwest on the North Fork Road, about two miles west then north on Polebridge Loop and Glacier Drive, one-quarter mile north on the Inside North Fork Road, then 5.5 miles northeast on Bowman Lake Road. After a second night at Bowman Lake and a day crossing the park and setting up camp at Rising Sun, we decided to hike to Poia Lake from the Many Glacier area. 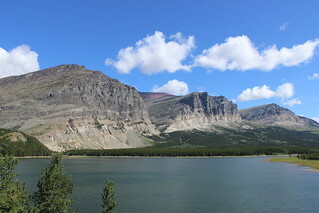 From the road into Many Glacier, two trails lead to Poia Lake, connecting near Swiftcurrent Ridge Lake. Since we were starting in hard rain, we chose the shorter cutoff trail that begins next to the Many Glacier entrance station. From the entrance station, we climbed steeply and straight to the northwest for about 1.1 miles, through aspen stands and wildflower meadows, then met the longer trail from the Apikuni Falls area. At the junction, we turned northeast, passing Swiftcurrent Ridge Lake and crossing the ridge itself about three-quarters of a mile farther. From the forested ridge, we switchbacked north down the muddy trail to Kennedy Creek, where we crossed paths with a couple of hikers from the East Coast and came upon a relatively fresh set of bear tracks at about 2.75 miles. 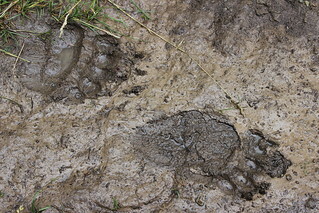 As they had never encountered a bear before and were planning to hike farther than us, we advised them to be noisy. At the creek, we turned west and climbed again, through a boulder field and back into the trees above a bend in the creek to the outlet of Poia Lake at about 4.5 miles. Here are more photos from Poia Lake. Distance: 9 miles round trip. 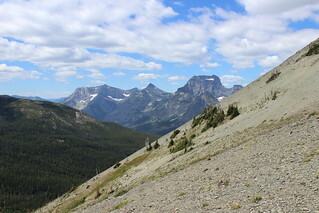 Trailhead: We started from the Many Glacier entrance station, about 7.5 miles southwest of Babb on Many Glacier Road. Another trailhead, which also provides access to Apikuni Falls, is about 3 miles farther into the park. Mostly sunny weather the next day was the best of our trip, so we chose the longer hike to Cracker Lake, one of the most well-known lakes in the park because of its striking turquoise water. 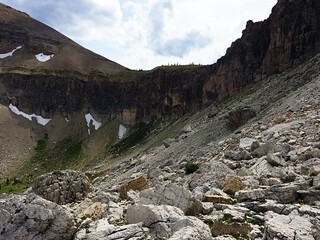 While the fairly popular trail wasn’t as crowded as the High Line or Grinnell Glacier, the dozen or so hikers we encountered were the most we saw on any outing during our trip. We started west from the Many Glacier Hotel parking lot, passing a turn to Piegan Pass shortly after leaving and dropping to the junction with the Cracker Flat loop at about 1.5 miles. This first section was well-trod by horses, so watching where we walked was necessary, but it also provided views across Lake Sherburne to Altyn Peak and Apikuni Mountain. Past the Cracker Flat junction, we switchbacked south up into the forest, with occasional openings in the trees offering glimpses of Swiftcurrent Lake and Mount Wilbur. At the top of the switchbacks, we continued climbing above Canyon Creek, eventually reaching a crossing at about 3.5 miles. After the crossing to the east side of the creek, we continued up the valley as the forest thinned and the trees grew shorter. At about 5 miles, we came out of the trees and got our first real view of the lake, Siyeh Glacier and Mount Siyeh above it and Allen Mountain on the west bank of the creek. Out in the open, the wind picked up, so we stopped briefly for Jen to fly a kite, then continued along the bluffs above the east shore of the lake. At about 6 miles, a rocky outcrop above the campground offered a place to stop and eat, and views all around. 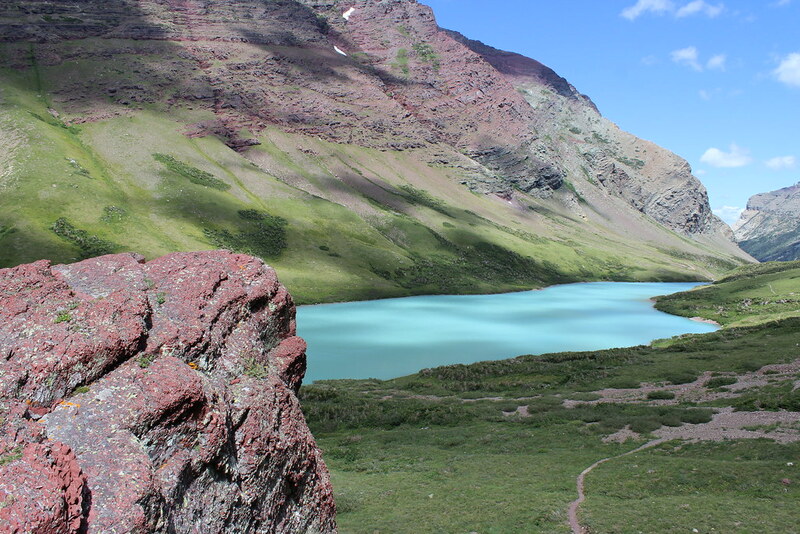 A trail down from the camp allowed us to explore the shore at the top of the lake and see the milky turquoise water – created by suspended silt from Siyeh Glacier – up close. After backtracking to the trailhead, we took advantage of Many Glacier Hotel’s Swiss Lounge, stopping for beer and an appetizer before driving back to camp. 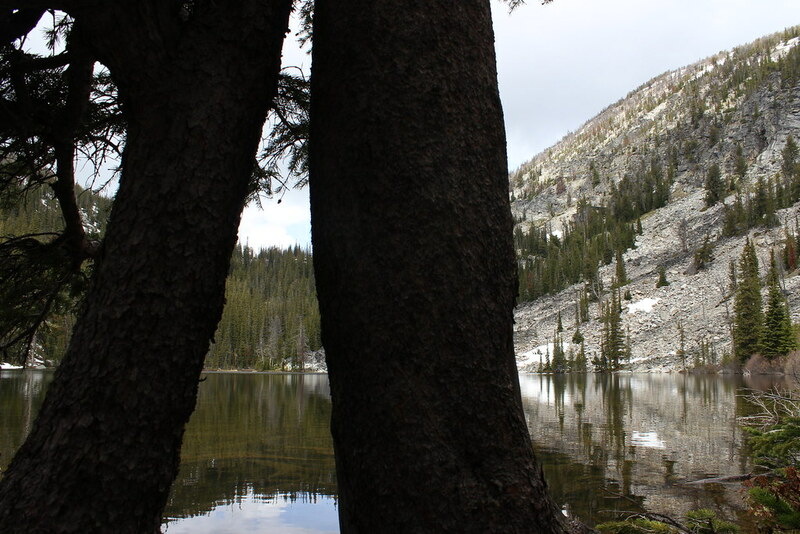 Here are more photos from Cracker Lake. Distance: 12.5 miles round trip. 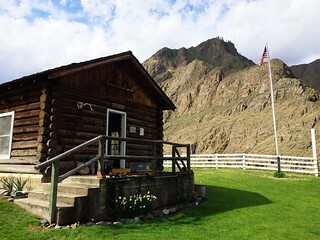 Trailhead: The trail starts at the southwest corner of the parking lot at Many Glacier Hotel, about 12 miles southwest of Babb on Many Glacier Road. On our way home the next day we drove around the southern border of the park, stopping along U.S. Highway 2 and the train tracks of the Hi-Line west of East Glacier to hike to Firebrand Pass. 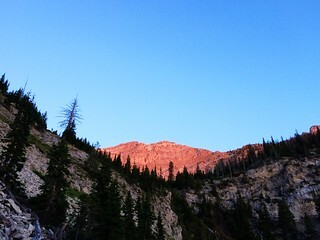 Aside from a handful of train whistles and the whipping of the wind at the pass, the hike was the quietest of our trip. We saw nobody along the trail, but later learned one of the two other vehicles at the trailhead belonged to friends. After crossing the tracks, we passed through a fence marking the park border and hiked steadily uphill to the northwest through grassy fields and aspen stands. In the forest at about 1.75 miles, we turned north onto the Autumn Creek Trail. 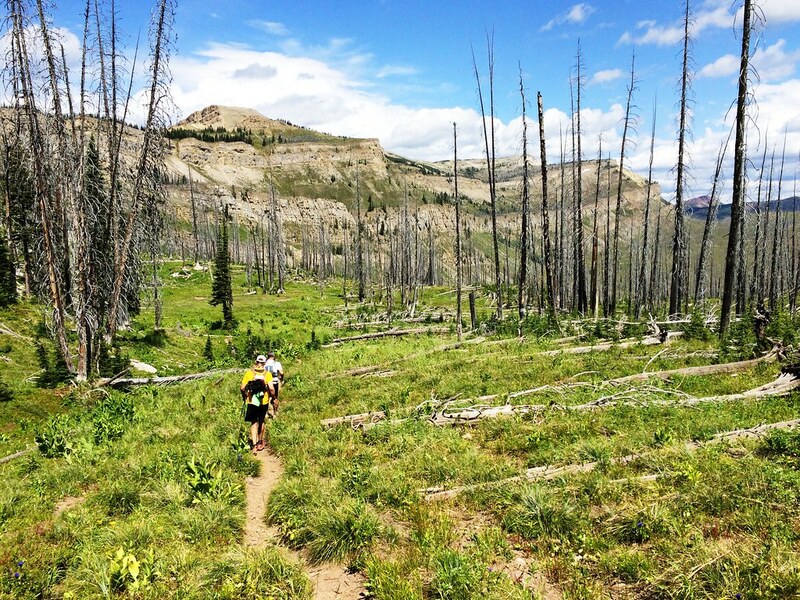 Half a mile later – out of the forest and in tall, thick vegetation – we turned northwest again and climbed the Firebrand Pass trail. 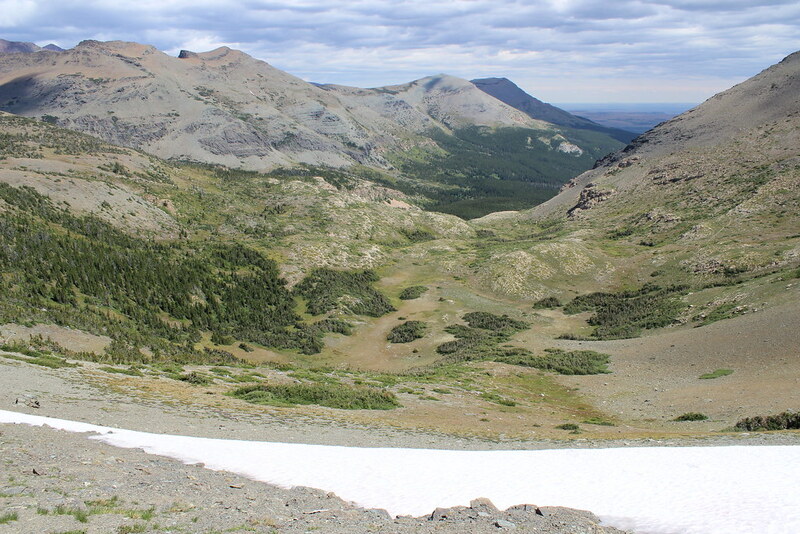 As we rounded the north flank of Calf Robe Mountain, we left the thick vegetation behind, crossed a small snowfield and continued up the trail into a subalpine basin above the Railroad Creek drainage. 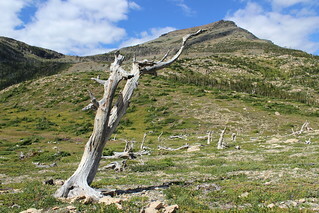 Ghostly white snags – remnants of the 1910 fires that gave the pass its name – stand where the final switchbacks begin. After traversing talus and a longer snowfield, we reached the 6,951-foot pass between Calf Robe and Red Crow mountains at about 4.7 miles. Just over the pass, the Ole Creek drainage opened up with views of the Barrier Buttes and beyond. A long drive back to Missoula ahead of us, we turned back here rather than continuing on. Here are more photos from Firebrand Pass. Distance: About 9.5 miles round trip. 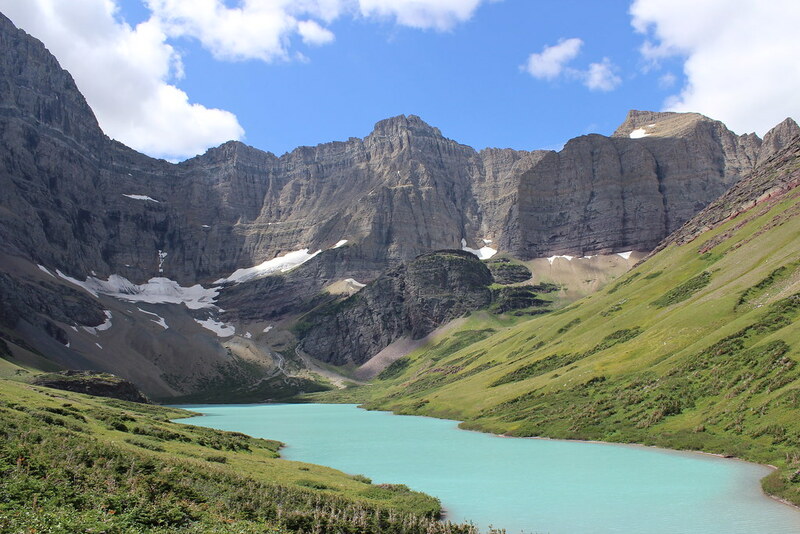 Trailhead: The trail to Firebrand Pass begins at a small, unmarked pullout along U.S. Highway 2 about 6.5 miles west of East Glacier or 5.2 miles east of Marias Pass. Visiting relatives in Portland, Oregon, always means driving through the Columbia River Gorge, which offers the perfect opportunity to go for a hike before arriving in the city. Over the years, the national scenic area east of Portland has become our go-to spot for getting out, with its numerous creeks and waterfalls. I don’t think we’ve ever been to the same place twice, though I’m sure we’ll eventually exhaust the options. During a June trip, we chose the trail to Wahclella Falls. 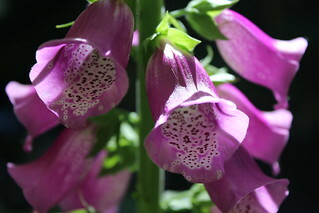 The hike began as an easy walk along the mossy east bank of Tanner Creek, among shade trees and wildflowers. 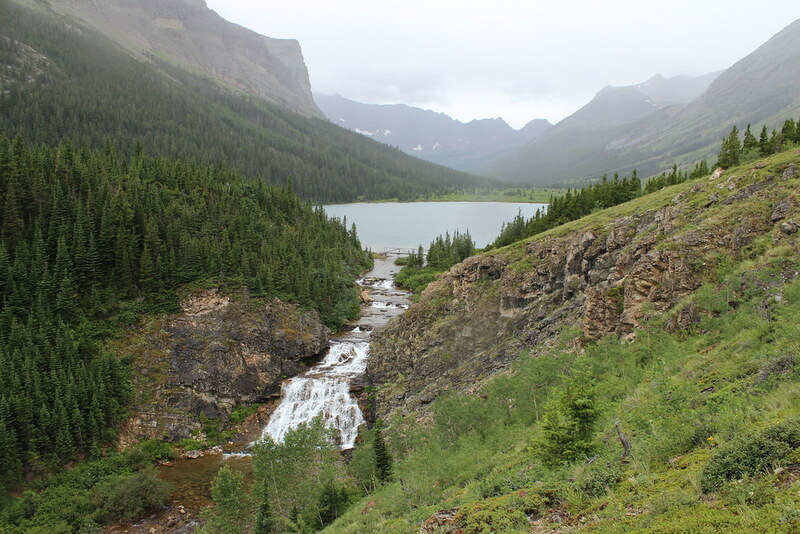 After a small dam, the trail narrowed, passed a small cascade, then climbed the canyon wall. 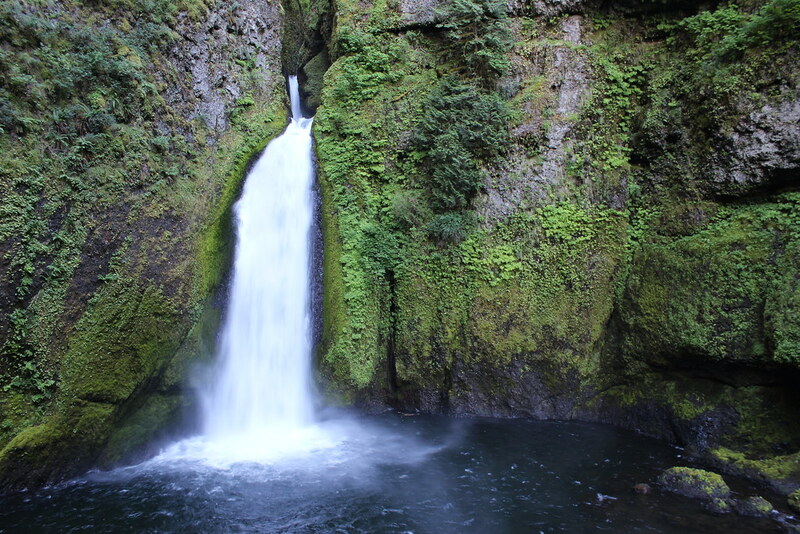 At a junction, we continued above the east side of the creek, then dropped to a viewpoint at nearly 1 mile, with Wahclella Falls spilling from the basalt into a large pool. 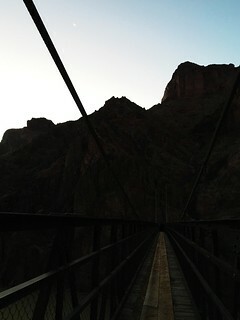 After a little looking around, we crossed a bridge over the creek and continued down the west side of the canyon. A short distance down the trail, a bridge returning to the east bank provided a view of the cascading creek below. Once across, the trail climbed a couple of switchbacks to the junction and we continued back to the start the way we came. 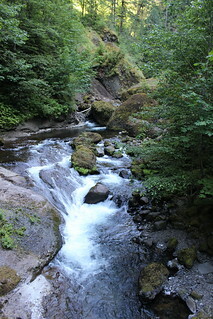 Here are more photos from Wahclella Falls. Distance: About 1.8 miles round trip. Trailhead: About 37.2 miles east of Portland on Interstate 84, take exit 40 and turn south. After 0.1 mile, turn southwest into the parking loop. A short May hike to Camas Lakes, southwest of Hamilton in the Bitterroot Mountains, highlighted the changing of the seasons: spring runoff and wildflowers, and the last of winter’s snow. 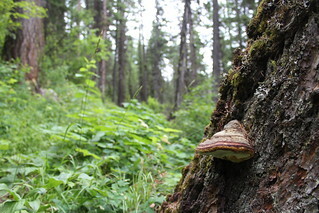 For the first mile, the trail climbed steadily to the north, crossing Hayes Creek at about a quarter mile then turning northwest at 1 mile and entering thicker forest. Along the way, purple and yellow violets dotted the edge of the path. Nearly 2 miles up, the trail crossed an open outcrop that provided a brief view of the surrounding drainage and eastern ridge of Ward Mountain. 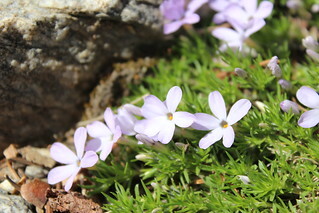 Here, tufts of phlox could be found among the rocks. About another third of a mile up, a broken log bridge crossed Camas Creek as it cascaded down through the forest. While our younger dog Josey followed us across, our older dog Belle forded the creek. Across the water, the trail climbed two-thirds of a mile of switchbacks as the forest thinned, then the final half mile past patches of snow to the lowest of the three Camas Lakes. While it’s possible to round the lake and continue up the creek to the next two, we ate lunch on the shore then retreated to the trailhead when rain arrived. Here are more photos from Camas Lakes. Distance: About 7 miles round trip. Trailhead: About 9.4 miles south of Hamilton on U.S. Highway 93, turn west on Lost Horse Road. Continue 2.4 miles, then turn northwest and follow Forest Road 496 about 6.1 miles to the trailhead. 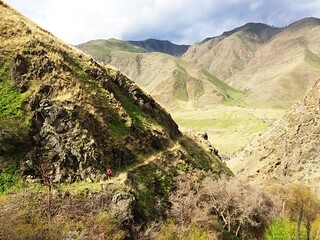 As it did last year, my trail running season opened in late March with a trip to western Idaho for the Hells Canyon Adventure Run. 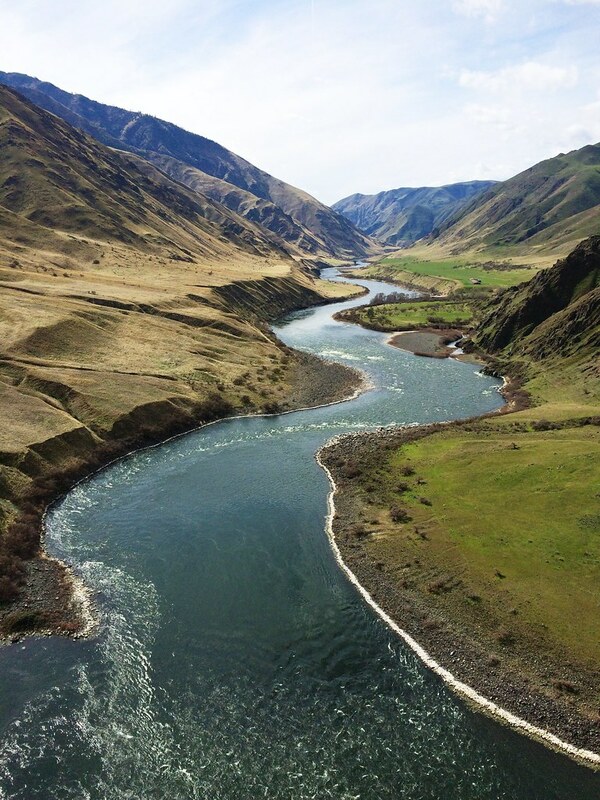 The event isn’t an organized race – jet boats ferry runners up the Snake River about to drop-offs at 15 and 25 miles, and they return unsupported along the national recreation trail, ascending and descending the eastern side of Hells Canyon. The “organizers” send out an email with the date in advance and request replies in order to arrange for the boats. The only payment is made to your boat driver. This year, Jen and the dogs came along and hiked out and back on part of the trail while I ran. We spent Friday and Saturday nights camping at Pittsburg Landing, southwest of White Bird in the Hells Canyon National Recreation Area, with a group of Missoula friends. Early Saturday morning – the second day of spring – we made our way to the trailhead at Upper Pittsburg and warmed ourselves by a fire while waiting for the boat. Due to the timing of the daylight saving change, dawn arrived before we departed upriver; last year, most of the boat ride was by moonlight. After being dropped off downstream from Granite Creek, several of us from Missoula set out as a group. A light rain fell as we ran, keeping it cool, and we stopped several times to eat and take in the view. The first 10 miles of trail rose and fell along grassy slopes and through occasional stands of trees, crossing creeks and passing a couple of historic homesteads. About 15 miles in, we passed the drop-off for the shorter run at Sheep Creek, and our group soon began to spread out. After taking in the view of the winding Snake below and the sun breaking through the clouds above from a high point at about 17.5 miles, I ended up on my own for the next few miles. With about 5 miles to go, I arrived at the historic Kirkwood Ranch, and just as I was departing Jen and the dogs hiked in. After spending some time with them, other Missoula runners caught up and we left as a small group, our younger dog Josey coming with me. The climb out of Kirkwood was the single largest ascent of the day, rising more than 400 feet in about a third of a mile to a steep traverse looking down on the river. After dropping closer to river level, Josey and I got ahead of our group again and finished the last couple of miles on our own, taking a break at a creek to cool her paws in the water then running along a shaded cliff and back to the trailhead. In the end, I logged about 25.5 miles and 4.300 feet of elevation gain. We cooled off in the river there as we waited for the other Missoula runners, Jen and our older dog Belle to return, and that night we shared food and stories around the campfire before bed. On Sunday morning, we woke, packed up camp and drove back to Missoula, stopping for a hearty breakfast along the way. 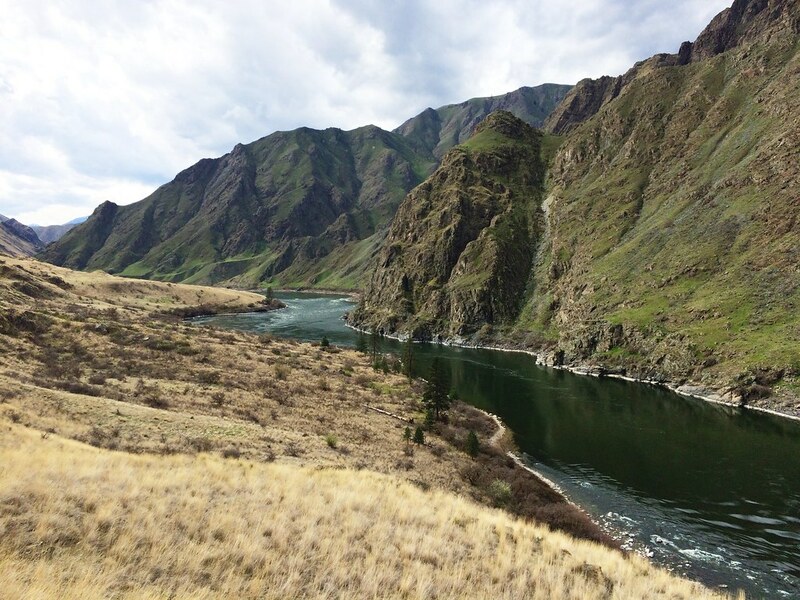 Here are more photos from Hells Canyon. The last stop on our Icelandic itinerary was the Snæfellsness Peninsula, jutting west into the Atlantic Ocean and ending at a glacier-capped volcano. About three hours after leaving Akureyri, we turned off the Ring Road, following smaller, snow-covered highways most of the way out the north side of the peninsula. Over the next couple of hours, we first passed through farmland blanketed in white then along the mountainous coastline, which had a fresh layer of powder that at one point was about floorboard deep on our vehicle. Before turning onto a better maintained highway near Stykkishólmur, we had passed maybe five houses and only a few other vehicles. An hour later, we arrived in Grundarfjörður, where we stayed for the next two nights. Search the Internet for “Iceland” and you’re likely to find photos of a pointed peak next to a cascading waterfall with the northern lights overhead – that’s Kirkjufell and Kirkjufellsfoss just outside town. After checking in at our guesthouse – an old post office that had been renovated – we used the rest of the late-afternoon light to hike the short trail to the waterfall and drive farther west, toward Snæfellsjökull National Park. Heavy snow fell as we returned to town, and as it continued into the night we became hopeful we would finally get to go cross-country skiing. 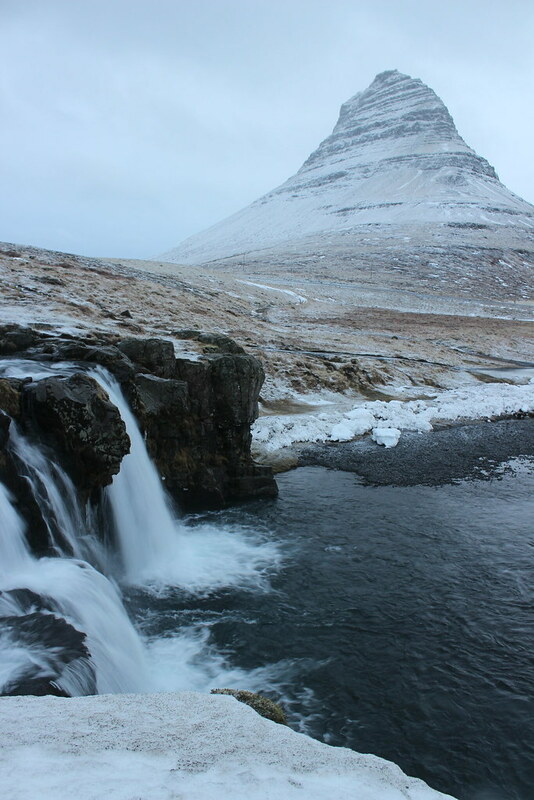 We’d had noticed a wide, flat path paralleling the highway from town to Kirkjufellsfoss and a trail around Kirkjufell, and with the amount of snow on the ground by the time we went to bed we had the next day planned. 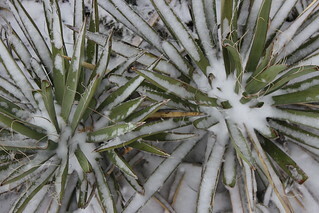 Unfortunately, the night air warmed, the snow turned to rain and by sunrise everything was soggy. The rain continued to varying degrees – from light sprinkles to downpours – throughout the day, so we drove the road through Snæfellsjökull and around the peninsula, stopping for a few short hikes. 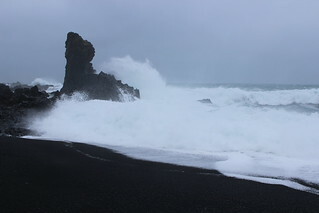 A short drive off the main road through the park, we followed a trail down to the black sand beach at Djúpalónssandur. At the bottom, a series of stones that once provided fishermen a test of strength remained. On one side of the beach, waves rushed ashore on the sand; on the other, they crashed into sea stacks. 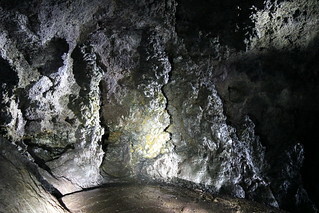 After leaving the park on the south side of the peninsula, we turned back and stopped at the Vatnshellir lava tube. We don’t usually go on organized tours, but that was the only way to access the tube – and despite dripping water, it ended up being one of our direr activities that day. Through a passageway dug from the snow and down a spiral staircase, we descended into two sections of tube 32 meters beneath the surface. 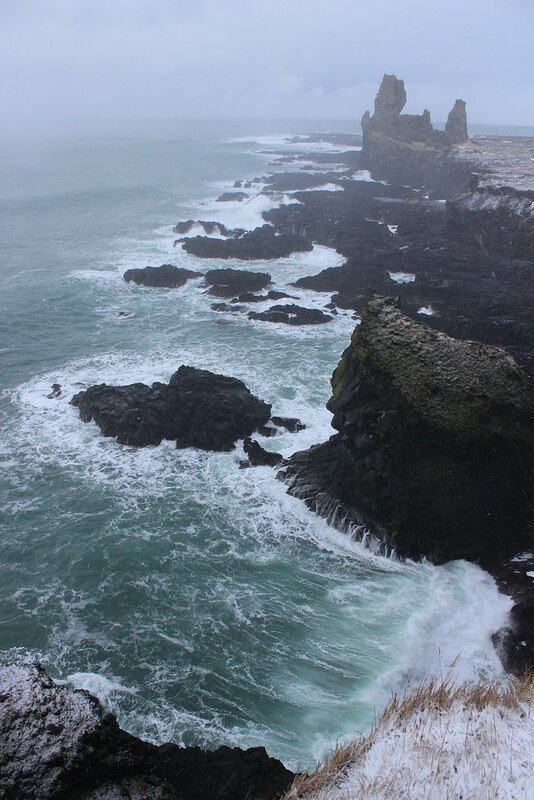 Along the way, we learned about the geological formations within and the lava’s path to the sea. The next day – our final day in Iceland – we drove back through Snæfellsjökull on the way from Grundarfjörður to Reykjavík. Despite having been through the park the previous day, the four-hour trip wasn’t uneventful. 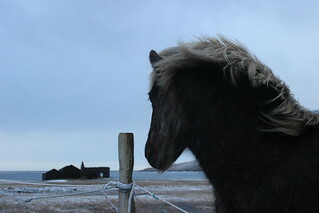 After stopping to watch some horses in a pasture just outside town, the wind picked up as we rounded the peninsula. Soon, snow was blowing across the road, at times completely eliminating visibility beyond the windshield. With two sets of faint headlights behind us, we continued until reaching an area where the topography disrupted the wind and whiteout conditions. Letting the other vehicles pass, we stopped and went on a short walk to view the Lóndrangar basalt plugs. The rocky pillars remaining from volcanic activity rose from rough seas near a lighthouse. Back on the highway, conditions deteriorated further. After passing a line of stopped vehicles outside the park on the south side of the peninsula, we, too, pulled over as the wind gusted to more than 30 meters per second, or 67 miles per hour, and the road disappeared. After waiting about 10 minutes, we pressed ahead, and once off the peninsula the wind died, visibility returned and we continued to the capital. The next day, we departed from Iceland after a stop at the Blue Lagoon, having neither skied nor seen the northern lights, but satisfied with our winter vacation. 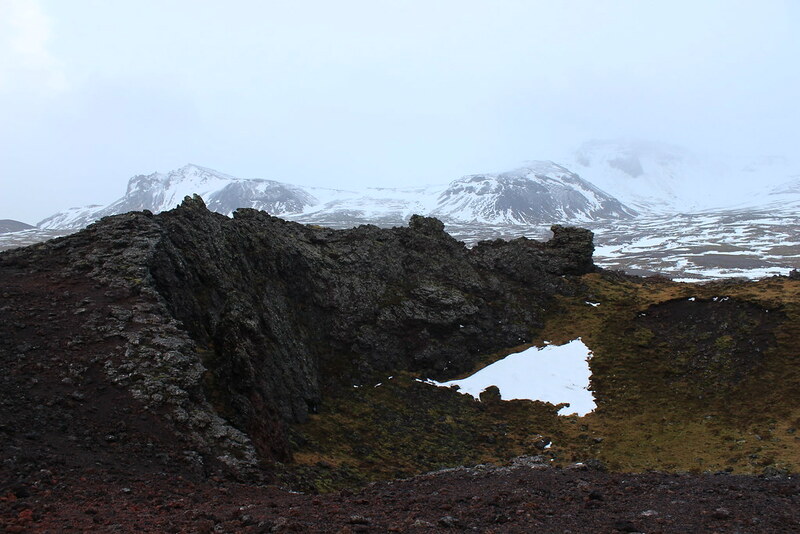 Here are more photos of Grundarfjörður and Snæfellsjökull National Park. TRAILS + TRAVELS, Create a free website or blog at WordPress.com.